What is the wind tunnel? A vertical wind tunnel has fans at the top to draw air through the flight chamber and then push it back down the sides through Return Air Towers (RATs). The air is turned from the RATs into the bottom of the tunnel (plenum) and back up toward the flight chamber through an inlet contractor. The inlet contractor reduces the space the air can travel in, thus compressing and speeding up the air before it reenters the flight chamber. The result: a smooth column of air that enables you to fly. The flight chamber in the wind tunnel is 4.3 meters in diameter and 14 meters flying height. The glass surrounding the cell airport reaches a height 5.5 meters and can fly through a tunnel at the maximum speed of 270 km per hour. 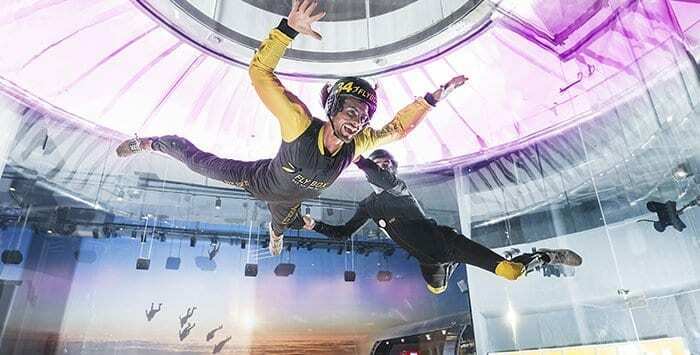 FlyBox wind tunnel was established to fulfill a personal dream of all of us to fly. FlyBox provides a safe, fun and exciting experience, accessible to everyone. We believe that desires can become a reality every day! The tunnel was founded by a team of partners that have been taking part flying in the wind tunnel and outdoor skydiving and for over 20 years. We worked in collaboration with the IBA organisation to bring the world class technology to Israel .We have professional team of instructors waiting for you in order to fulfill everyones dream to flight.